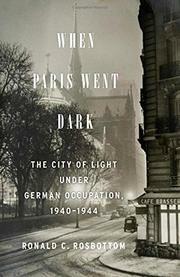 The City of Light passed the war years in a period of sustained urban anxiety, when lives were constantly disrupted and fear reigned. France’s army, “the uninspired being led by the incompetent,” surrendered to the Nazis in June 1940. Rosbottom (Arts and Humanities, French and European Studies/Amherst Coll.) explains the interactions of the French and their occupiers in a way that illuminates their separate miseries. He makes us see that we can never judge those who lived during the occupation just because we know the outcome. If you think you might live the rest of your life under Nazi control, you do everything you can just to survive, feed your family and not get arrested. Who can judge what is accommodation, appeasement, acceptance, collaboration or treason? When they moved in, the Germans requisitioned all automobiles, rationed food, established curfews and cut back on power. The French police were merely German puppets, responsible for nearly 90 percent of the Jewish arrests. The members of the Vichy government were equally reviled. The author attentively includes German and French letters and journals that explain the loneliness, desperation and the very French way of getting by. Both during and after the war, the French seemed to be highly prone to denouncing their fellow resistors, neighbors, friends and family, but the Resistance was nothing like we’re shown in many popular portrayals. Instead, there was mostly quiet defiance, such as whistling when Nazis trooped by or printing anti-German and anti-Vichy tracts. The Resistance was only truly effective the few days before and after D-Day. Otherwise, the foolhardy deeds of a few young, disorganized men brought brutal reprisals and misery. A profound historical portrait of Paris for anyone who loves the city.